A holiday special production from Hipster Data Science. Have you ever wondered what shape your friends are? Err, I mean what shape your friendships are. I have, so over Christmas break instead of spending time with my friends I spent all my time sitting on a couch writing scripts to visualize how often I talk to my friends. 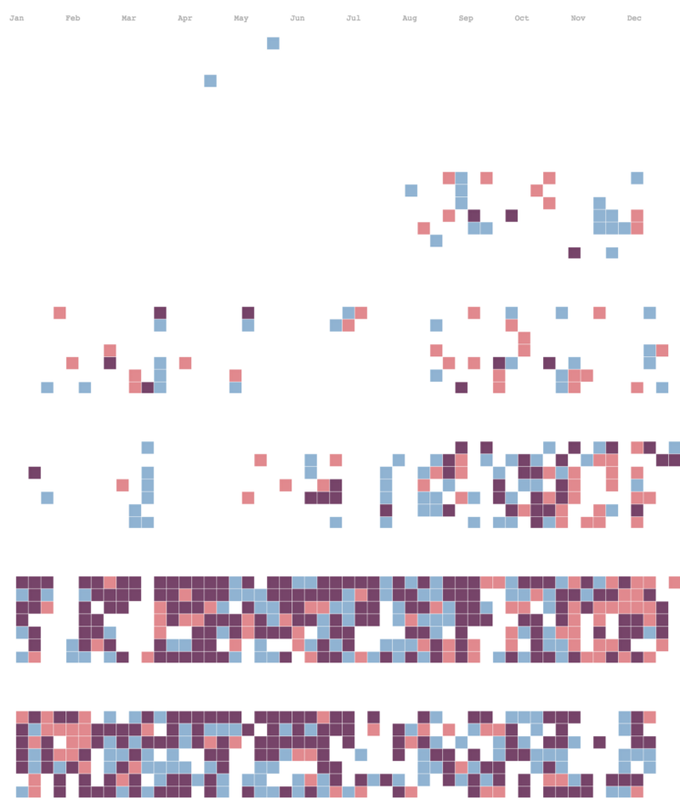 Here is a visualization of every text or instant message I’ve ever sent to a certain human from the day we met until the day I wrote this, 58,215 chats. Each row is a year, each cell is a day. The coloring of the cell indicates how many messages we sent to each other that day. Empty cells are days when we did not message each other. The first time I made one of these graphs I was pretty elated. It felt like I was seeing something that no one had ever seen before. A story that was previously only accessible by querying my feeble memory was squeezed right out of a pile of logs. Obviously I couldn’t just stop with one, I needed to see what this looked like applied to all of my human friend people. Not coincidentally, I’ve been archiving the majority of my digital messaging since 2007 for just such a project. ~800,000 messages in all. For the scientists: y axis is number of messages in a week 0–5000. 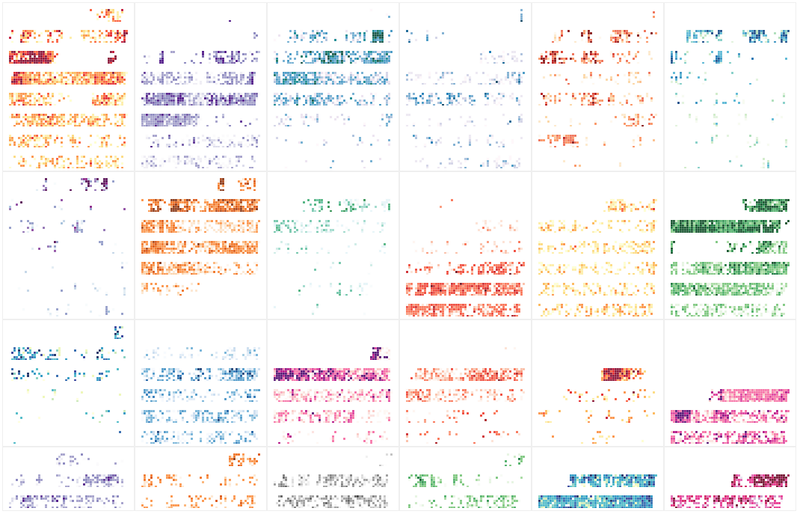 Here are the heat maps for the 25 most contacted people in the dataset, which represent 70% of all messages. The axes are not listed here but they are the same as the above heat map, each row is a year with 2014 at the bottom. Wow, look at that. That is pretty cool. 588, 867 messages covering 1/3 of my life are represented in this chart. I’ve spent more than a few hours this week staring at this chart and sharing it with the people in it. The chart contains nearly everyone who I’ve ever chatted at least 3000 messages with, which doesn’t seem like a very high number. When I started running these numbers it was incredible to see just how few people made up the vast majority of my communications. A casual glance at the darkest areas of the chart for any given year shows most chats going to 5–8 people, and this core group shifts around slowly. If you were paying attention, you might have noticed I said this was my top 25 but there are only 24 squares. Congrats, you win a cookie. The truth is I really liked the 6 x 4 grid size so I combined a married couple into the same square. But just because you’re married doesn’t mean you should be stripped of all your individuality. To make it up, here’s a second look at my messages to them. Red or blue means I only talked to one of them that day, purple means I talked to both. That’s all for now. Special thanks to literally everyone I’ve ever talked to electronically, you’re the best. This blog post wouldn’t be possible without you. Gold star for you. Much of the code I use to curate and visualize this data can be found at https://github.com/Chandler/scinia but it is still very much a work in progress and probably won’t be of great use to anyone else for a while. Here are the known data gaps. 2007–09 to 2009–09 I am missing all text messages. This is the date range between when I got my first cell phone and when I started using Google Voice full time. You may notice a lot of charts begin at this date. ?? to 2011 I am missing some early Facebook chats because Facebook chat history was not kept by the service until Facebook merged chat and messenger in 2011. I stopped tracking Skype after 2011–10 due to incredibly sparse usage, I basically stopped using Skype overnight when I moved to California.